The newest route up Mount Kilimanjaro just might be its best. That’s because the Northern Circuit route is a combination of all of the best elements of the other routes, rolled into one fantastic hike. If you’re looking for beautiful scenery, plenty of solitude, a healthy challenge, and the potential to spot wildlife, this is definitely the route for you. The Northern Circuit route follows the same route as Lemosho route for the first few days, but rather than sticking to the south side of Kibo, it turns to the little-used northern trails instead. This path is virtually devoid of other trekkers and as a result, the campsites are quiet, peaceful, and practically deserted. Because the Northern Circuit route is longer than the other trails, it gives trekkers a chance to take in more of the mountain. Not only do they get a chance to hike across the awe-inspiring Shira Plateau, they’ll also catch glimpses of Kibo Peak and Uhuru Summit along the way. It also provides amazing views down onto the open plains that are found to the north of the mountain, something that is seen by only a handful of other hikers while climbing Kilimanjaro. 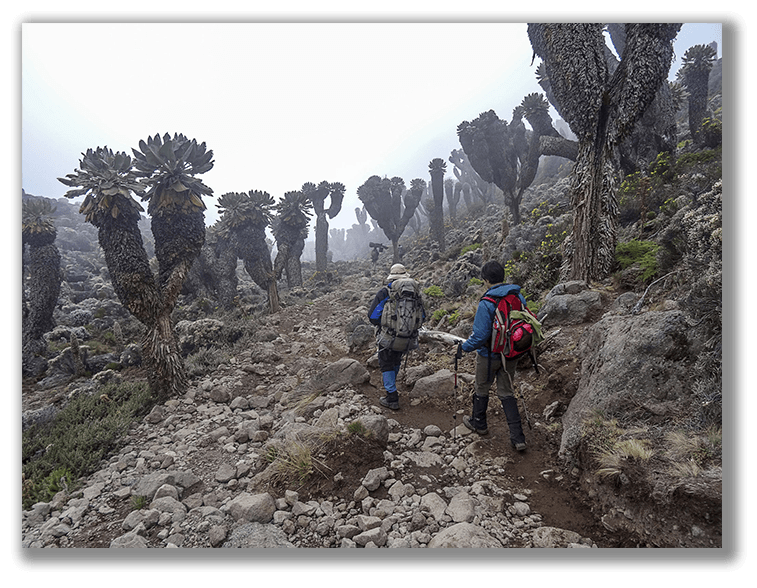 Due to its extended length, much of which hovers around the same altitude for improved acclimatization, the Northern Circuit route has the highest success rate of any of the routes on Mount Kilimanjaro. The trek begins at the Londorossi Gate and makes its way up the western flanks of the mountain, passing through the rainforest and climbing onto the the Shira Ridge. From there, it is up to the Shira Plateau itself, before heading north to circle in a clockwise direction starting at the Moir Hut, then moving on to Buffalo Camp, and finally School Hut. Along the way, trekkers make an almost 360 degree hike around Kilimanjaro, before summiting from the east. So with everything that the Northern Circuit route has going for it, what’s the downside? The only issue with hiking this route is that it requires a bit of extra time, something that few travelers have. While most of the other routes can be done in as few as six or seven days, the Northern Circuit route often requires as many as nine or more. That often limits the number of people who can work this trail into their schedule, although those that do will find that it is completely worth it. From your lodge, we will make our way to the Londorosi gate on the Western side of Mt. Kilimanjaro (a few hours drive from Arusha). We will begin our hike at the Lemosho trail head. Please note that in rainy/muddy conditions, sometimes the vehicles can’t make it to the true trailhead so there can be some extra hiking – but Serengeti Pride vehicles usually make it farther than any other company due to our great drivers and vehicles. After a picnic lunch, we will hike for about 4 hours to the forest camp. In the forest, exotic moss and flowers delight the eye while bird calls entertain the ear. You may see Black and White Colobus monkeys as well as signs of the elephants that travel in this area. We will overnight at Forest Camp. Hike about 4-7 hours, depending on stops along the way. You have quite a ridge to climb up as you depart Moir camp, so it’s best to start out very slowly until you crest the ridge. This is a great acclimatization day. Continue your traverse around the northern side of Mount Kilimanjaro, with expansive views, as you find your way to Third Cave Camp. We get into our highest elevation camp today. Try to get to bed early for some rest before you start your night-time summit ascent (usually starting around midnight) to Gilman’s Point, through Stella Point, and for the final push up to the summit. Summit day. We will start our ascent to the summit (19,340ft – 5,896m) around 11:00 PM or midnight the night prior. The goal for you – and numerous other climbers – is to reach the peak right at sunrise. In reality, due to differences in hiking speed, energy, and altitude acclimatization, there is a several hour span where most climbers reach the summit. Using headlamps (bring extra lithium batteries, which last much better in cold dark conditions!) you will ascend 6-7 hours to Gilman’s point, traverse the Crater Rim to Stella Point and then up another 1-2 hours to Uhuru Peak, the summit. After a summit celebration and photo, descend to Barafu camp for lunch and then to Mweka camp to sleep overnight. By advance request we can sleep at Millenium camp instead; this is at ~12,000’ so less descent today, but means more descent tomorrow. The questions and answers below are specific to the Northern Circuit Route. How difficult is the Northern Circuit Route? The Northern Circuit has a lowest difficulty level on all the Kilimanjaro Routes. Although it is the longest route, the longer itinerary means that it has the best acclimatization profile which makes the trek less difficult. The physical trek over nine days is excellent for altitude acclimatization and generally easy under foot. Good level of fitness is highly recommended. What is the distance of the Northern Circuit Route and how many days does it take? The exact trekking distance for theNorthern Circuit Route is 88km or 53 miles. The shortest number of days required for the Northern Circuit Route is 8 days, Shorter ascents are possible but mean some strenuous trekking days. By the time you have added on arrival and departure days it is 10 or 12. However, as it’s considered one of the longest routes on the mountain it is actually best done over 9 days of trekking to increase your changes of success. What is the Northern Circuit Route Summit Success Rate? The Northern Circuit is the longest route up Kilimanjaro which gives the best chance for acclimatization. Whilst there are no official statistics, the average success rate across all operators is 90%. However, We have a summit success rate of over 97% for the Northern Circuit Route! What is the Scenery like on the Northern Circuit Route? The main approach will take you through the rich Lemosho forest and across the Shira Plateau. Then as the climber traverses around to the remote and rarely-visited north side of Kilimanjaro, the scenery becomes more arid and austere. It is so remote here that the shy eland are often seen as well as the occasional buffalo that come to lick minerals from the natural caves on the high slopes of Kilimanjaro. When is the best time to Trek Northern Circuit Route? July-September is the best time to trek the Northern Circuit Route, as the weather is most stable during this period and encountering rain is less likely. That said, since it is close to the equator it is possible to climb the mountain at any time of the year. April and May is the rainy season so this period is best avoided.